I smell a bone. A bone that's BIG. I'll get it out, I'll dig and dig. A big, BIG bone! I know it's there! It will take work, but I don't care! 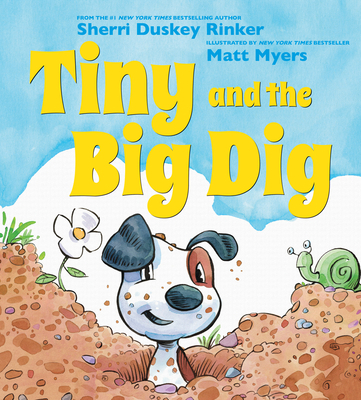 Sherri Duskey Rinker is the author of #1 New York Times bestseller Goodnight, Goodnight, Construction Site and Steam Train, Dream Train, as well as Mighty, Mighty Construction Site. She writes books with hopes of happier bedtimes, wrangling some smiles, and encouraging kids to dig deep and dream big! Sherri lives in the Chicago area with her photographer husband, two sons, and one fluffy dog. Visit her at www.sherririnker.com. Matt Myers is the illustrator of many books, including the New York Times bestseller Battle Bunny by Jon Scieszka and Mac Barnett, A Is for Musk Ox, Scarecrow Magic, Tyrannosaurus Dad, and EIEIO: How Old MacDonald Got His Farm (With a Little Help from a Hen). He lives with three little goblins in Charlotte, North Carolina. For more information, go to www.myerspaints.com.